It has been a busy few months, and I thought that it would be a good idea to post an update to let everyone know what I’ve been up to, and what events I have planned for the near future. I recently published a paper in the ISAR Journal in which I presented the results of a major discovery I made last year about the origins of western astrology. 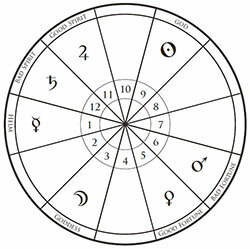 In the paper I show how the planetary joys scheme provides the motivation for a number if important astrological techniques and concepts, such as the assignment of the four elements to the signs of the zodiac, the origins of the significations of the houses, and part of the rationale for sect. For the print version please see the International Society for Astrological Research Journal, Vol. 42, No. 1, April 2013. On May 18, 2013 I will present a free online lecture on the planetary joys through the Kepler College website. The lecture will cover the same material that was first outlined in my paper on the joys, although I will also include some additional material that I was not able to include in the paper. If you sign up for the webinar ahead of time you will be sent a recording of it a few days after it is over, even if you aren’t able to attend. In January I launched a new course on electional astrology. The purpose of the course is to teach students how to use western astrology in order to select astrologically auspicious dates to begin new ventures and undertakings. During the first week of May I’m offering a 25% discount on the course, making it only $75 to signup. I also have a new column on electional astrology in the latest issue of The Mountain Astrologer magazine. In the column I use some same principles that I teach in my electional course in order to outline some auspicious electional dates over the next few months. There are some particularly auspicious electional dates in the second half of May, so if you have been thinking about starting a new venture, that would be a good time to do it. In August I’m giving a workshop on timing peak periods in a native’s love life by using the Hellenistic time-lord technique called Zodiacal Releasing. This will be a real hands-on workshop, and each person will receive a printout with their own time-lord periods, in order to time different peak periods in their love life. There are still some spots left to sign up for the workshop, although they will probably start to become more scarce as we get closer to the conference. You can find out more about the workshop or signup for it on the NCGR website. Lectures on conditions of bonification & affliction, and planetary joys. Speaking on traditional approaches to delineating relationships. Workshop on Hellenistic time-lord techniques. Speaking on bonification & affliction conditions, and giving a workshop on timing peak periods in a native’s love life.